→Which Is The Best Stainless Steel Tea Kettle For You On The Market? Which Is The Best Stainless Steel Tea Kettle For You On The Market? When choosing any kitchen cooking appliance, make sure it saves you time, money and energy. Even if your family is large or small, or you are using it to cook for guests, the following is the information about the best stainless steel tea kettle. This can help you to make the best decision on what you want for your kitche﻿﻿n. Where can you start from? There are many options to choose from. First of all, you should know what you want. 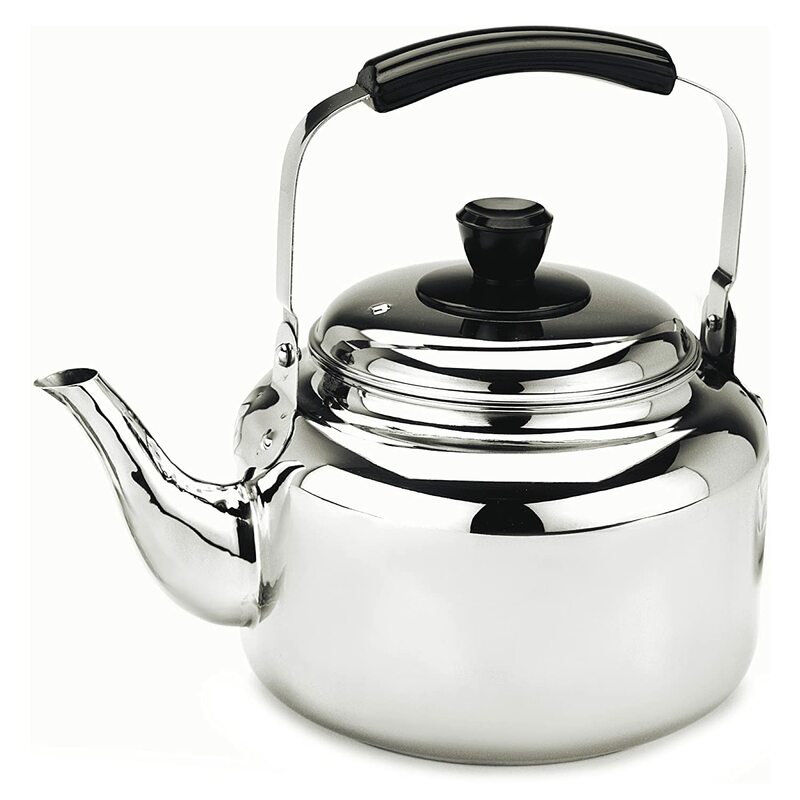 This information can help you to understand your needs when it comes to the best stainless steel tea kettles. Bistrot by ﻿Demeyere ﻿Belgium Resto Water Kettle 4.25-qt. Durability. Most stainless steel kettles have a long lifespan. My mother loves Pour over coffee kettle with a thermometer. She bought it when I was young, up to now it is still in good condition. 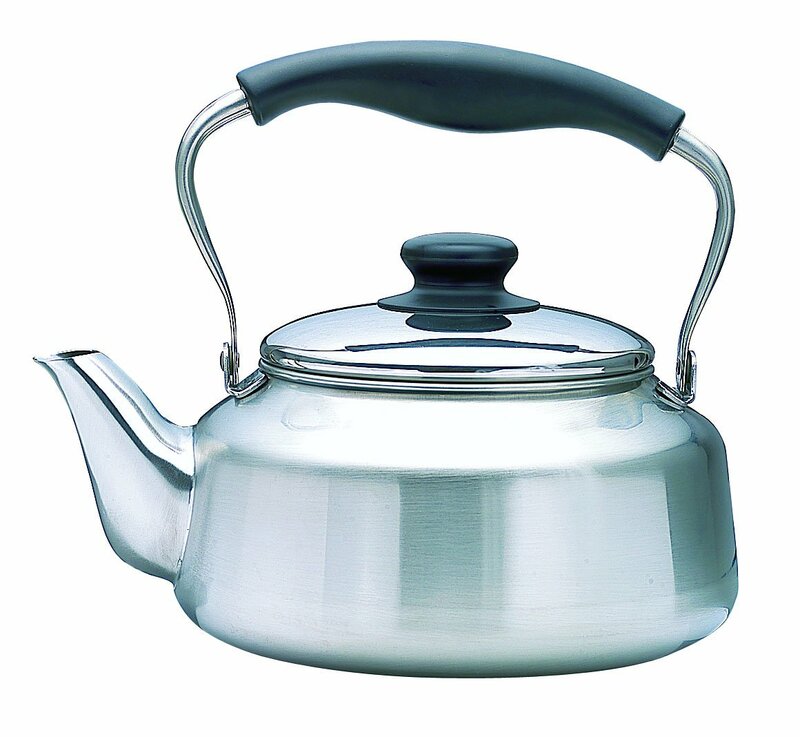 This type of kettle has long durability period. The design. 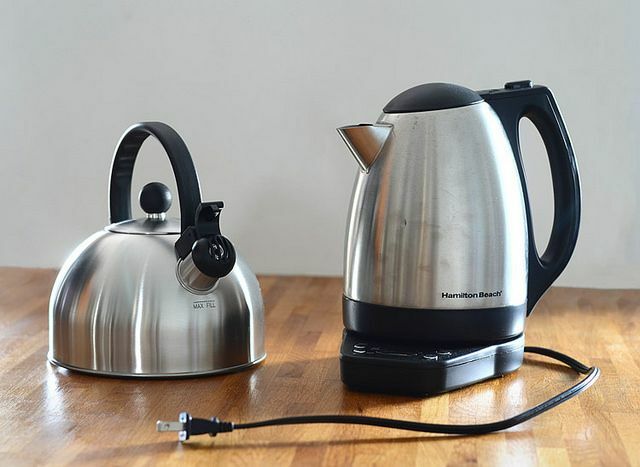 Kettles perform the same functions, like boiling water. But, other kettles perform the task better than the others. This is because of the way they are designed or constructed. Some are made from steel and others are enamel on top of the steel. Nobody wants to have a badly designed kitchen appliance. The capacity. There are many sizes of tea kettles. Think of how much you want the kettle to hold. This can depend on how many people you want to serve using that tea kettle. 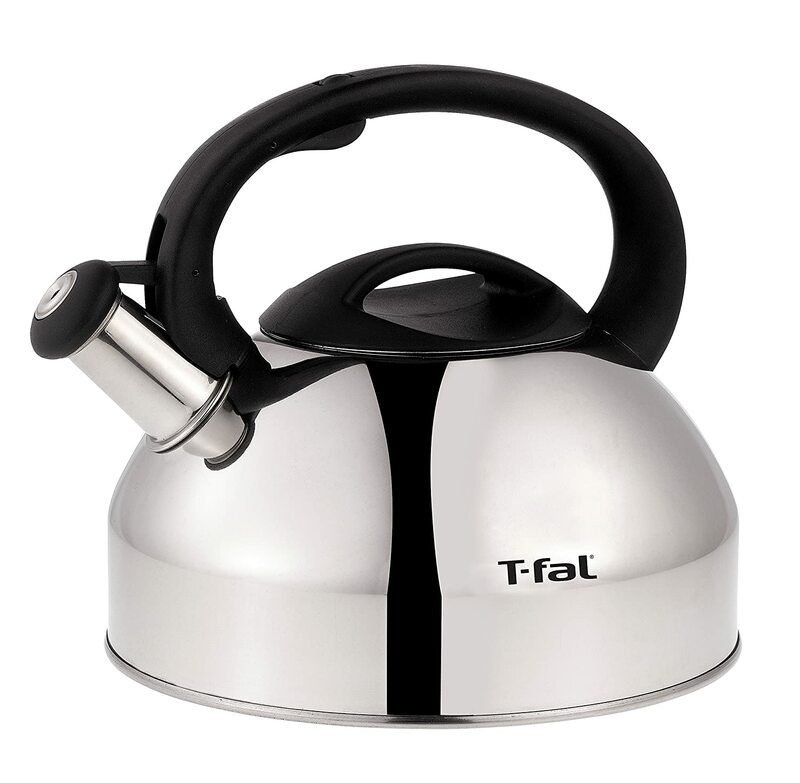 If you your family is large, go for a large kettle. The features. 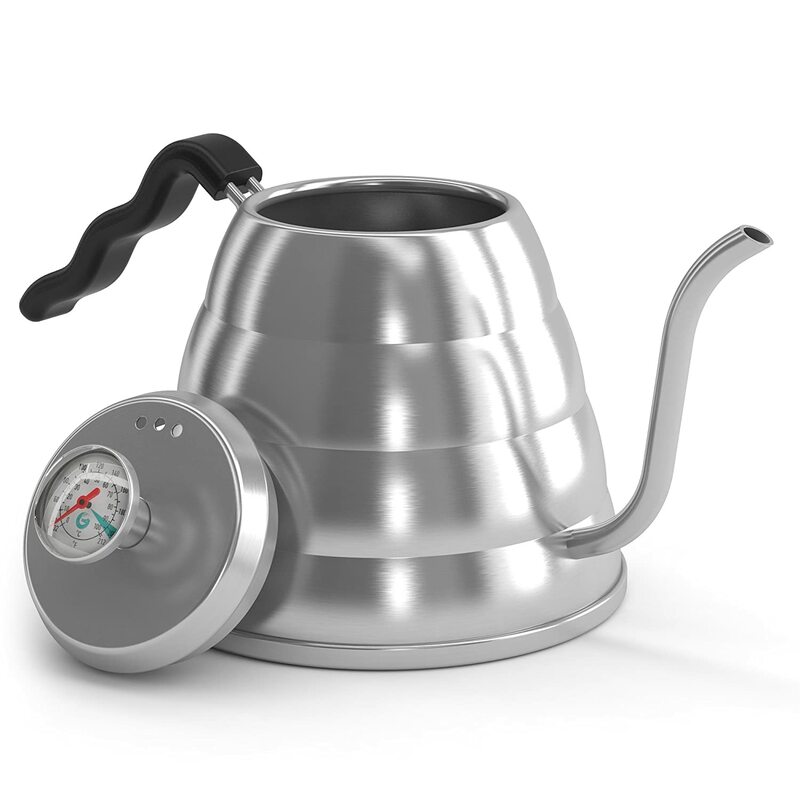 Different kettles have different features but perform the same function. Some kettles whistle while others don’t. Others can only be used on a particular cooking top while others can be used on any cooking top. We are going to look at some tea kettles and their features. 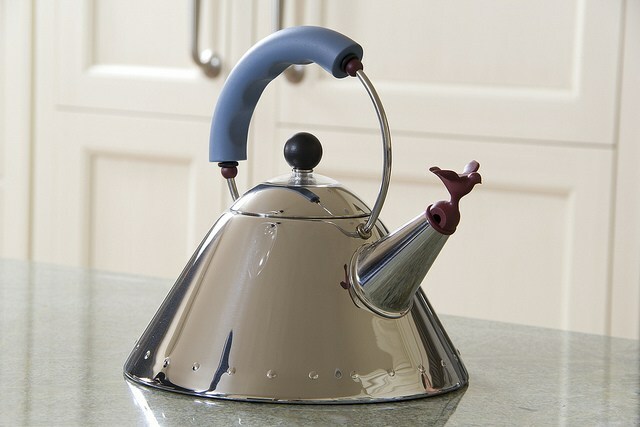 If you don’t like the whistling of a kettle, the Bistrot by Demeyere Belgium Resto water kettle may be the best for you. Resists rust. A good kettle is rust resistant. Nobody wants a kettle that will get rust. Other kettles need to be emptied and dried and dried after every use. This will help you to avoid rust. You may not be able to avoid this but some kettles better at resisting the rust. Heats water faster. Most people don’t like water to boil for a long time. The kettles that boil water faster are more reliable and efficient. ​The amount of tea to prepare. Before you purchase a tea kettle, consider the number of people you will make tea for. If you are brewing for a large group of people, choose a kettle that can hold a large capacity. This will help you to boil more water at once. A small kettle is good when boiling water for two or three people. Heat source. Most tea kettles are compatible with any heat source. Others can only be used on specific cooking tops. Choose a tea kettle that is compatible with your heat source. It can be gas or electric. I love this kettle very much. My husband bought it two years ago and it is still in good condition. The kettle is worth the money it costs. It is of high quality and is designed well. It has a long lifespan. It is manufactured in Japan. The kettle has a diameter of 7 inches. It can fit on an oversize burner. The kettle can be stored easily in the cabinet. This may be the best for those who don’t have large space in their kitchens. It looks nice on the stove top. The mirror finish is so impressive. ​It is made with a real stainless steel which is thin. The kettle is easy and comfortable to use. The handle can fold down to the other side, this makes it easy to store in the cabinet. ​It has a wide lid; this makes it easy to clean the inside. The kettle has no whistle. There is no dripping, splashing, or overfilling. The kettle is controlled with a colander like a plate at the base of the spout. At some point, the lid may leak when pouring the water. This is made of stainless steel. It holds a capacity of 4.25 quarts. It is safe to clean and care by the dishwasher. The kettle has a warrant of two years. The kettle has a high gloss finish. It has a welded stainless steel handle. It does not form seams at the bottom and there are no leaks. It is easy to clean take care of it. The kettle will be the best for those who don’t like the whistling of kettles. You can boil the water silently without any noise. But this requires you to be around when the water is boiling. The kettle is large. You can use it if you have a large family. The spout pours out easily. The kettle has a long lifespan. The lid doesn’t fall off when pouring water if it is twisted slightly. It has no whistle. You may have to stay around to see when the water boils. ​It takes a little bit long to boil the water. The handle may get a little bit hot. The capsule bottom made of copper. It has a mirror finish that is elegant. The kettle has a capacity of 2.75 quarts. It is available in black color. It has a whistle that reminds you the water that the water has boiled. The copper capsule bottom is designed to heat water faster. It also retains the heat. The handle and the knob are both heat resistant. You can handle them when the water has boiled. The kettle has a lifetime warranty. This may be good for you if your family is big or you need a lot of water. It can boil more water for tea, chocolate, and coffee. It heats water very fast due to its innovative design of the copper capsule. It can retain the heat for some time. The handle and the knob are heat resistant. The kettle is beautiful. You can serve your guests from the kettle directly. This kettle is awesome. It is good for hand drip coffee. It has a capacity of 1.2L. It is available in stainless steel color. This kettle is good for drinking coffee. It is nice and impressive. It has a thermometer that can help you when heating water to the desired temperatures. It can be used on any heat source. It is made of surgical s﻿﻿tainless ste﻿﻿el. This makes it more durable. The kettle may be good for a smaller family. It has an inbuilt thermometer. This will help you to brew the best coffee every time. The kettle pours the water smoothly. There is no splash. This is because of the gooseneck design. It makes coffee with minimum fuss. It is easy to clean the kettle. It requires no special brush or tool to clean the inside of the kettle. It works well on any cooking top. That is electrical, gas stove, and induction. The handle is heat resistant. It can be handled safely without burning your fingers. It has no whistle. You should be around as the water boils. It is dishwasher safe. It has a loud inbuilt whistle which can let you know when the water is ready. It is available in silver color. It has a capacity of 3 quarts. It is made of heavy stainless steel material. This makes it more durable with a lifetime warranty. The handle is made of Bakelite that is heat resistant. The kettle is not compatible with the induction cooking﻿ top. This may be good for those with large families or if you consume a lot of tea. It is nicely designed with a user-friendly handle. It has a pleasant whistle that lets you know that the water ready. 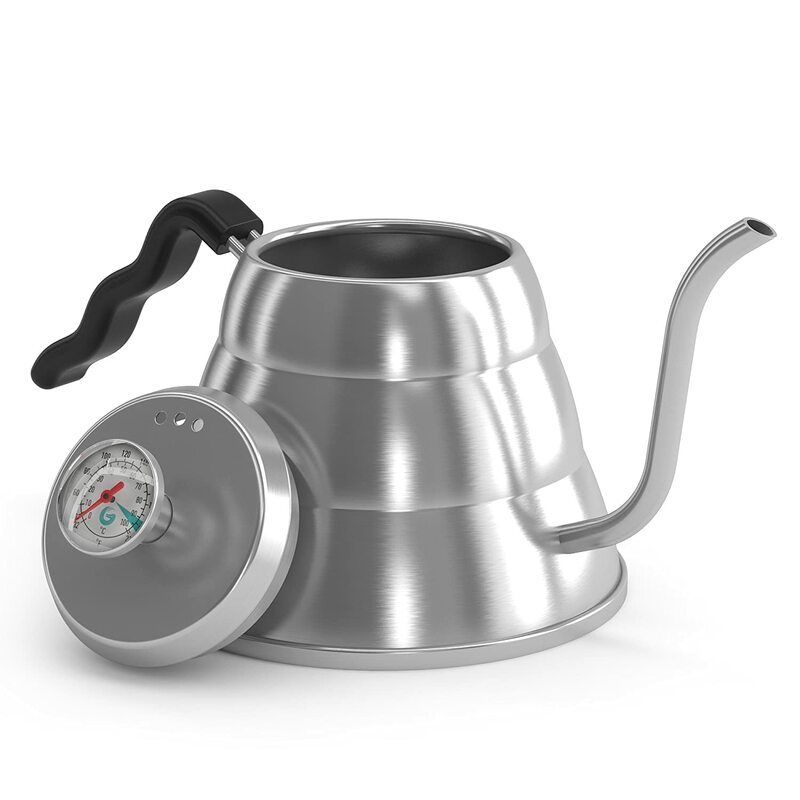 I love the Pour over coffee kettle with a thermometer. It is my favorite stainless steel tea kettle. It works for me best when heating water for coffee or tea. The handle is heat proof and the thermometer is accurate. Early in the morning, I can quickly boil water for my tea or coffee. I have used it for the last two years and it is in good condition. I bought one for my mother, she loves it very much. She can control the water pour. She uses it to heat water for tea or coffee. 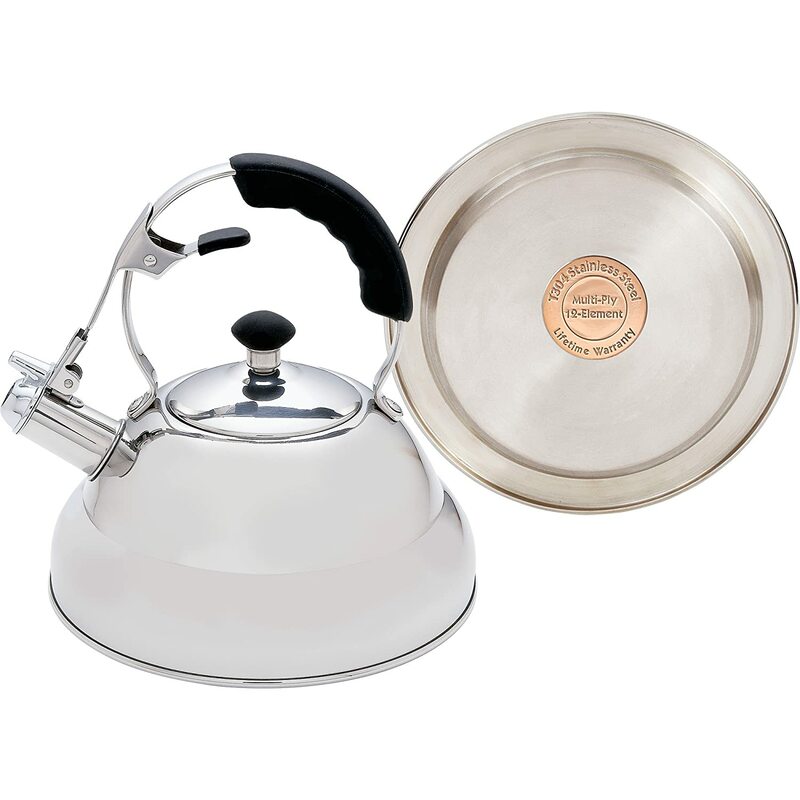 For a stainless steel kettle to be in good condition, you must take good care of the kettle. Keep it clean always. You can empty the kettle and dry it after using. This will protect the kettle from rust. 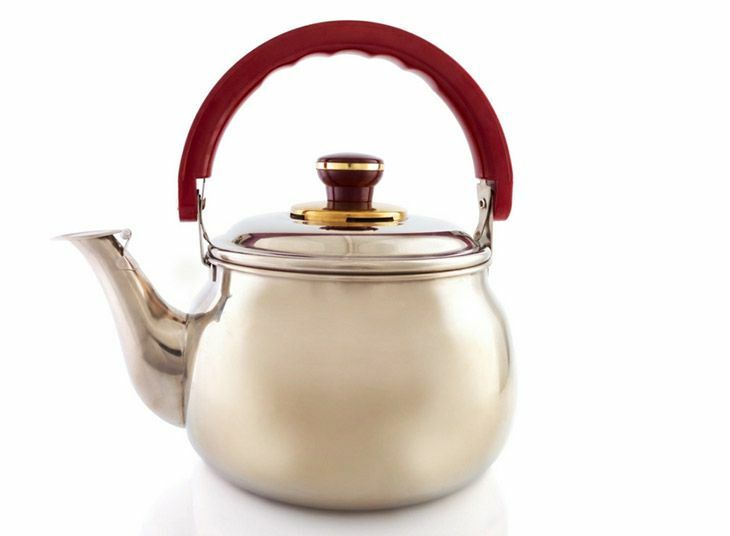 The above are some of the best stainless steel tea kettles that you can choose from. They are of high quality. 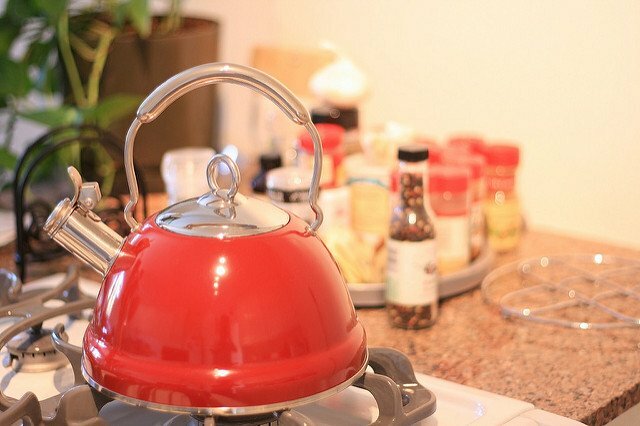 If you got informed through this article, please feel free to share with you friends and those who may need a guide to buying a stainless steel tea kettle. You can also share your opinions in the comments. You can need a Thermos for tea or coffee.